Nearly a week after Hurricane Maria battered Puerto Rico, students who can't return to school may need to continue their education on the mainland. Some of the largest school districts in Florida, plus major cities like New York City and Chicago, are preparing for the possibility of an influx of students from the island. In South Florida, Miami-Dade County public schools are already working to accommodate students who need to transfer from Puerto Rico. The problem right now? 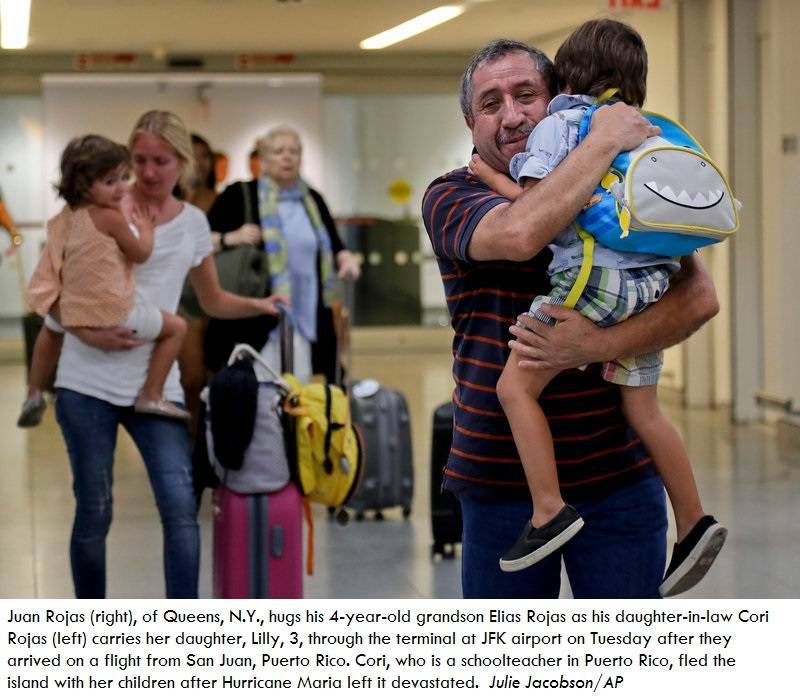 "We haven't seen that influx yet and a big reason is the airports," says Jackie Calzadilla, the media relations director for Miami-Dade public schools. Puerto Rico's largest airport, San Juan's Luis Marín Muñoz International Airport, is barely functioning, with only a dozen flights that left on Monday. On Tuesday, most flights heading to New York, Baltimore and Orlando, Fla., were canceled or delayed. Officials in the Orlando schools are also preparing for a smooth transition. "We are saddened to hear of the impact Hurricane Maria had on Puerto Rico and the difficulties many families are experiencing," Lorena Hitchcock wrote in an email. Hitchcock is the spokeswoman for Orange County public schools — the district that covers Orlando. The district plans to waive documents necessary for enrollment to ensure students have an easier transaction. And to make it easier for families to receive such additional services as counseling and food, students will be registered and coded into the district's system automatically. "We are prepared to respond to the needs of families in transition and support a continued education for students," writes Hitchcock. This is not the first time students in Puerto Rico have needed to be relocated. ​In May, Puerto Rico's government announced that 179 schools were closing because of the territory's $70 billion debt. To save $7 million, about 27,000 students were relocated to other schools. Those students were moved within the island, often just a few extra miles to their new schools. This time, students will have to cross an ocean. More than 2,000 miles away — in Massachusetts — one school has experience with this. "We have procedures in place," says Azell Cavaan, spokeswoman for Springfield public schools, in a city that is a two-hour drive from Boston. Cavaan says the district has dealt with helping a large influx of students previously. For example, the school typically gets Somali refugees or sometimes has to deal with placing students when a charter school closes, she says. "We know how to assign students to schools," she says.